Historian David Irving today launched his appeal against a libel case ruling that branded him a "Holocaust denier", insisting he had never disputed the murder of millions of Jews. 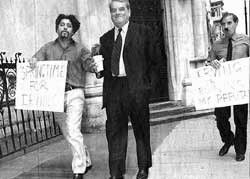 In what was almost a re-run of the historic trial, which came to its climax 14 months ago, Mr Irving faced American academic Deborah Lipstadt and publishers Penguin across a courtroom packed with the press and public. Launching his application for permission to appeal against Mr Justice Gray's judgment - which is expected to include a bid to produce fresh evidence - Mr Irving's counsel, Adrian Davies, said that the author had never said that the killing of the Jews was "in any way excusable". He told the Court of Appeal that the findings of justification in respect of the "defamatory" charges on which Professor Lipstadt and Penguin succeeded were against the weight of evidence. He would argue that the judge erred seriously in weighing the evidence, so that his findings were wrong and unjust. Mr Justice Gray said that Mr Irving had, for his own ideological reasons, deliberately misrepresented historical evidence and portrayed Hitler in an unwarranted favourable light. He sued Professor Lipstadt and Penguin over a 1994 book, Denying the Holocaust: The Growing Assault on Truth and Memory, which, he said, destroyed his livelihood and generated waves of hatred against him. Faced with a £2m bill for the defendants' legal costs, he has funded the appeal with the help of contributions from supporters - many of whom are from the US. Mr Davies said that the judgment against Mr Irving was that he had "falsified history". "It's not that he's a nasty person who holds horrible views and knows lots of people who hold even more horrible views." He said Mr Irving had to persuade the court that the trial judge should not have found that the defence of justification was made out in relation to the accusation that the author was "a liar". The author had never denied that the Nazis and their collaborators had murdered millions of Jews and that up to 4m Jews died in concentration camps. Mr Davies said: "I say that nowhere in the entire core of Mr Irving's work, in an authorial life of nearly 40 years, when he has given countless broadcasts and public performances, has he said anything which remotely began to suggest that he thought the Nazis did a jolly good thing - or even an excusable thing - in rounding up all the Jews in eastern Europe and putting them into camps - that it was in any way excusable." THE GUARDIAN, Wednesday, June 27, 2001: "IRVING JUDGMENT RESERVED. Three judges yesterday reserved judgment over an appeal by the historian David Irving against a libel case ruling which branded him a 'Holocaust denier'. The judges said they would take time to consider their decsion.